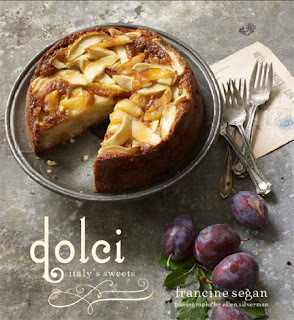 Our friend Francine Segan has a new cookbook, and now she's a guest blogger here. If you know her previous books I'll bet your mouth is watering at the mere mention of it. At the table you don’t grow old. My latest cookbook is just hitting bookstore shelves this week! I'm so thrilled. It's filled with fun Italian foodie sayings like the one above, plus tidbits on Italian lifestyle, history trivia, and over 100 recipes. Full disclosure though -- NONE of the recipes in this book are actually mine. That might sound odd coming from a cookbook author, but it's true. It takes a village to raise a child? Well, it sure took an entire country to write this cookbook! I gathered the recipes from all corners of Italy, from hundreds of generous, enthusiastic Italians, eager to share their country's culinary traditions. They opened their homes, kitchen cabinets, recipe files, and hearts to me. The recipes come from all of them, and the result represents their work as well as mine. Each person spent many hours with me, either in Italy, on the phone, via email, or on Skype. They helped me comb through details and nuances until finally, I was able to recreate reliably what I had so enjoyed in Italy. Here are two recipes that use the wonderful fall fruits -- apples and grapes. The apple cake is so delicious it's the book's cover photo. 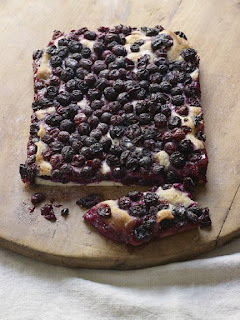 The grape focaccia is a classic Florentine mid-morning or late afternoon snack. Schiacciata -- meaning, "flattened or squashed" -- is the term they use in Florence for foccacia. Said of a particularly pretty cake or pie. At first glance it may seem like a huge ratio of apple to dough and you’re going to be tempted to cut down on the apples. Don't! It looks like a lot of apples, but they magically meld into the batter. You'll love the result. The top half of the cake is chock full of tender apples that float over sweet moist cake. Preheat the oven to 350 degrees. Butter and flour an eight-inch cake pan. Beat 2/3 cup of sugar and the eggs in a large bowl, using a whisk or electric handheld beater, until creamy and light yellow. Beat in the flour, milk, baking powder, baking soda and zest. Pour the mixture into the prepared pan. Peel and core each of the apples. Dice one of the apples on sprinkle the dices over the batter. Cut the remaining apples into thin slices. Spread the slices over the diced apples in the pan in a neat pattern. Scatter thin pats of butter over the apples and sprinkle with the remaining tablespoon of sugar. Bake for about one hour, until dark golden and cooked through. This dessert is actually two focaccias, one baked right over the other, topped and stuffed with plump grapes. The bottom crust bakes thin and crisp while the top puffs up tender and cakey. Some of the grapes collapse a little and release pools of pretty purple juice, while others stay whole. When you take a bite, you get the satisfying chewiness of bread, crunchy in spots, plus the warm grapes, which burst in your mouth. It's sophisticated and rustic at the same time. Scrumptious on its own, it goes well with a dessert cheese or a glass of red wine. In a small saucepan, heat four Tablespoons of the oil and rosemary until warm. Allow to cool. Reserve. Sprinkle the yeast in 1/2 cup of warm water and let rest until it bubbles, about 2 minutes. Sift the flour onto a clean work surface or in a large bowl. Make a hallow well in the center and fill with the yeast water, reserved rosemary oil, three Tablespoons of the sugar and salt, and slowly begin to incorporate the flour into the center hollow, until dough forms. Knead the dough until smooth and rest it in a lightly oiled bowl until it doubles, about one hour. Preheat the oven to 350 degrees F. Pour two Tablespoons of the olive oil into a rectangular baking pan, about nine-by-thirteen inches or fourteen-by-ten inches. Put the grapes into a bowl and using a large fork or potato masher, gently mash about half of the grapes, leaving half of them whole. Don't mash them to a pulp! Just gently break the skin. Take slightly more than half of the dough and roll it out to fit the baking pan. Put the dough into the pan and brush with the Two tablespoons of remaining olive oil (if you like, you can use a branch of rosemary to brush on the oil). Top with 1/2 of the grapes. Sprinkle with fourT ablespoons of the sugar and one teaspoon of the anise seeds. Roll out and hand stretch the remaining dough to fit the pan. It will be thin. Put the dough over the grape layer. It's okay if it doesn’t fully cover the bottom layer. Spread with the remaining two Tablespoons of oil, remaining grapes, sugar, and anise seeds. It's okay if the grapes roll off onto the sides of the pan. It all comes together nicely as it bakes. Allow to rest for 20 minutes before putting it into the oven so the ingredients can absorb and the dough settle. Bake for about one hour until golden brown on top and cooked through. Allow to rest at room temperature, in the baking pan so the focaccia can absorb the grape's juices. Serve at room temperature.